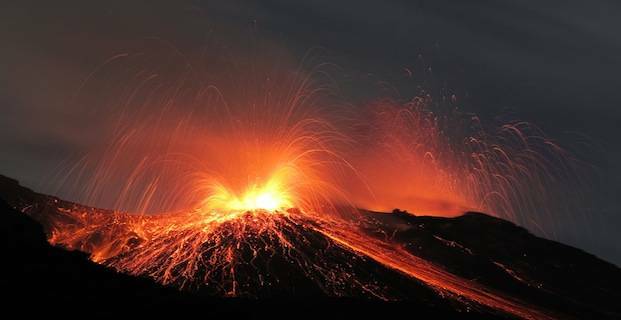 A volcanic eruption is one of the most dangerous and magnificent natural disasters. 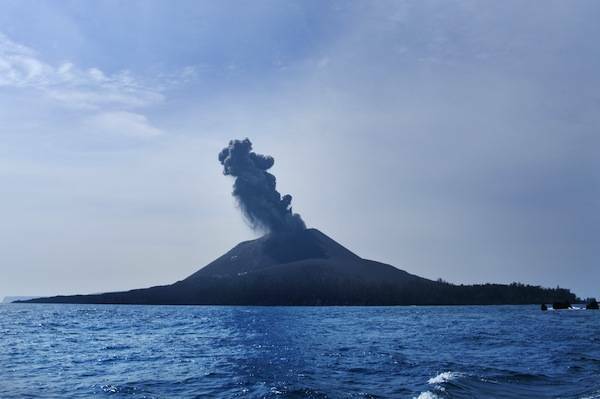 When a volcano erupts, the volcano sends out ash clouds, lava and even volcanic bombs. There is a high risk of danger from slow moving lava; though, the lava might move slowly, it is very dangerous and can cause a lot of damage to property and human life. Magmatic eruptions – when gas is released under decompression. Phreatomagmatic eruptions – when a thermal contraction comes from water. Phreatic eruptions – when steam erupts. When there is an earthquake, little vents are created in which magma is allowed to form. This is pushed up through these vents and towards the crust of the volcano. Steam vents are created when the magma reaches a certain level and reaches a boiling point which begins the eruption. The eruption might result in a total eruption. This is when gas driven explosion send magma to the volcano’s crust creating lava outpouring from the volcano. Some eruptions are not as strong as others. All volcanic eruptions can vary in strength; with some not reaching any civilians or causing too much damage. However, others can spread over a vast area, sometimes reaching several miles from the volcano. Some eruptions do not always contain lava flow or lava fountains which aren’t always very dangerous. However, some eruptions can be on a huge scale, very violent and very, very dangerous with explosions heard from the volcano. Some eruptions can be passive and not very dangerous however; some are explosive and can be very and high dangerous. Some volcanoes do not just erupt from their peeks, some can have eruptions at any part of the mountain, it’s not just the peeks that are the most deadly for volcano eruptions. One of the biggest and well known eruptions was in Pompeii. The entire city of Pompeii was buried when the volcano at Pompeii erupted. However, this is only one example of a type of eruption; another type of eruption is in Norway, a volcano that had been dormant for years suddenly became active, however, the local towns were evacuated and the volcano erupted. However, there was no great scale eruption. Lava flowed but didn’t reach the town, this was a very small eruption compared to many others. When Can An Eruption Happen? Volcanic eruptions happen deep down inside the earth. When the earth’s tectonic plate’s shift, it causes more than just earthquakes, it can create new volcanoes or vents. Underneath the surface of the earth, debris, gases from the planet and molten rock are stored creating new formations of vents and volcanoes. As soon as the magma thickens and builds up with the gases of planet can create explosions and cause lava to flow upwards and have ash released into the air causing thick clouds of smoke often seen overhead volcanoes. If there is an increased magma but a decrease of planet gases, then the eruption will not be as great. However, lava can reach an amazing heat possibly even 2000 degrees Fahrenheit; sometimes it can be even higher than that. Lava can actually destroy everything in its path, even an entire village. There can be huge rocks or even boulder types reigning down from the volcano and onto populated areas. There can also be toxic gases and ash which causes severe lung problems to many vulnerable people including children and elderly people. Volcano eruptions can happen at any given time. If there is a change to the tectonic plates in which a volcano sits on, then it can erupt at any given time. There is no set time as to when they will erupt or how much damage they’ll cause. When there is a volcanic eruption, there could be many other dangers which occur. These things can be such as flash floods, mudflows, landslides and rock falls, and even earthquakes. However, there can also be things such as fire and acid rain that follows a volcano erupting. It might not seem as though there are many active volcanoes erupting but there is a great deal of active volcanoes and the fact that they haven’t erupted doesn’t mean it will always be like this. There are dangers every day from active volcanoes. What Can You Do Before A Volcanic Eruption? There are steps which anyone can take before a volcano erupts and they are very simple steps. These small but simple steps can help protect homes, and protect your families also in the event of a volcanic eruption. If you live in an area which has an active volcano, even if it might be up to 100 miles away, there is still a risk because a volcano can erupt at any time. This can be a small but important kit of some of the simplest items such as water, and non perishable foods. You should look to add batteries, radios, battery powered or hand cranked radios. You can also have torches or flashlights just in case of a power cut or blackout; and have a first aid kit should anyone get hurt. All of these supplies should be kept in a location which is easy to reach such as a car just in case you need to be evacuated or are being told to do so. If possible, try to add breathing masks or goggles to see through thick ash clouds. A disaster such as a volcano erupting can happen at any given time and it does mean your family mightn’t be at home when it happens. This is why you do need to think about getting in contact with other family members and meeting up again. You need to think carefully about all eventualities and have a good plan to get the family reunited once again. These are simple plans but if you do live in an area very close to an active volcano, they could end up saving your life and your family’s. You might not realize or understand that a volcano is active or is about to erupt either, however, when a volcanic eruption occurs, you have to be vigilant. You have to be aware of what could happen and how a volcano works. When an eruption occurs, lava can spill over and can absolutely cause mass devastation. Even if the volcano isn’t moving fast towards the local town or village, there are still many dangers that can cause harm. The ash clouds can be very dangerous to a person, as is the poison gases and flying debris and rocks. There are many dangers to volcanic eruptions, though this is a natural disaster that cannot be tamed or predicted. It might sound as though volcanoes aren’t that dangerous if they haven’t been active for years but they’re still dangerous. They have intense heat from lava flows and of course the acid rain can all become dangerous.